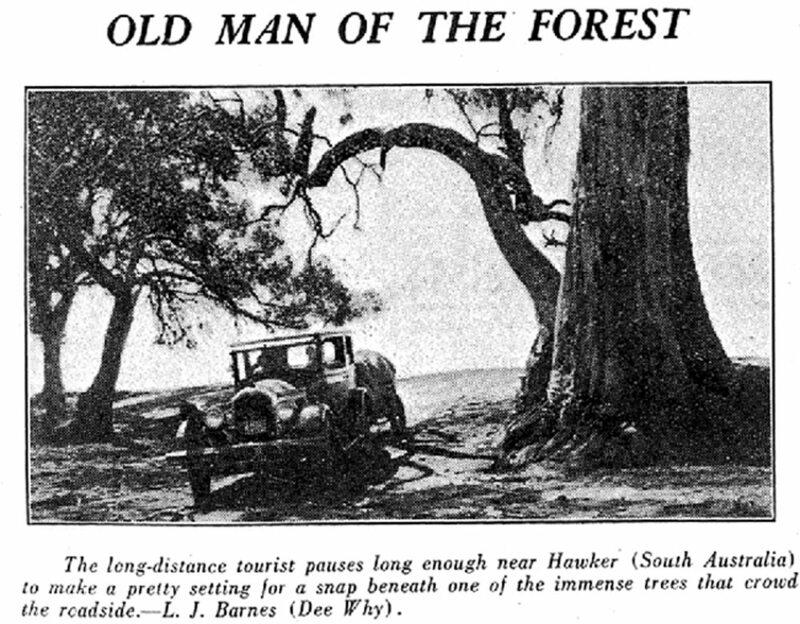 Webmaster?s Note:Whilst the article makes little reference about the car, it is a 1927 Buick, model 27-20, 2door Coach, which clearly gave great service during this remarkable trip. What is a round-Australia motoring trip like? Can you die of thirst? Are the roads-pardon, tracks!- any good? Can you miss your way very easily? Let Mr L.J.Barnes, of Dee Why-artist and business man-tell you. He returned recently from a 9,000 miles tour of the outback from Sydney to Sydney, taking nine months for the job. With him were Mrs. Barnes and his sister, Miss Doris Barnes and his two sons, Lawrence (aged 18) and John (14). The ladies left the party at Port Agusta: Mr. Barnes and the boys went on to Perth, Derby, across to Queensland and then south. 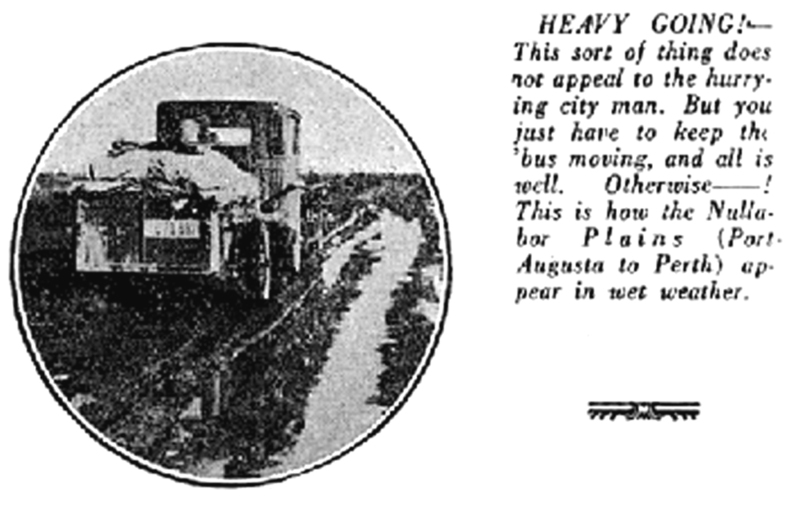 There is nothing to fear about water supplies, Mr. Barnes told “The Open Road.” there is good water to be had at regular intervals between Port Augusta (South Australia) and Perth. 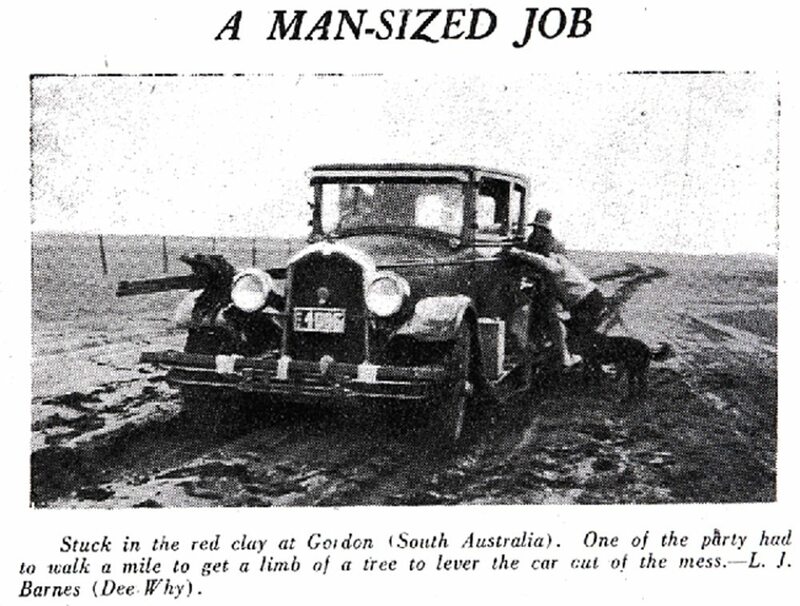 The West Australian and South Australian Governments have erected catchments- tanks covered by big iron roofs-about every 35 miles, and the traveller is assured of a good supply of rain water at each. These catchments, too, make excellent camp sites, and as time is everything on that journey, the cross-country tourist is grateful for the respite from pitching the tent. There is no need to pitch a tent all the way. Good water is available from Perth to Broome, mostly bores or stations on the track, and from Derby artesian bore water, beautiful to drink, is at hand about every 50 miles right across to the Queensland border. On the whole the cross-country track is good all the way, except in wet weather, of course. In dry weather one can put up a really good performance. Only in one or two places can one miss directions. Between Derby and Fitzroy Crossing, for example, the track is broken up with other tracks running to stations. But by watching the speedometer the right track, if lost, can be rejoined. Mr. Barnes missed the way only once. They had 30 miles to go to the next station, but after 36 miles had passed they knew they had taken the wrong track. It was just a matter of retracing steps, and watching the mileage, to get on the proper course. A humorous touch was provided at Madura Pass, on the Nullabour Plains between Port Augusta and Perth. The party arrived at a station late one afternoon and saw a black gin shivering in the cold, wearing little else than a thin cotton frock. She asked for a coat. Unfortunately the party had no surplus clothes, the only coats being rainskins, and they felt sorry. In the morning, however, the lady was seen strutting around in a tick fur coat that she had, in despair, brought from her boudoir. Apparently previous visitors had been more fully equipped in that regard! Laurie, the elder boy, assumed the job of looking after the car. He was the driver of the party. John was allowed to drive on the open plains. And he got a scare once. a lot of cattle was met, and the bulls had a nasty habit of stopping dead in the tracks until the car was within a few feet. Had the car stopped for them there might have been trouble. John caught up with a huge bull, who refused to budge until the car was almost touching him, when, with a snort, he dashed off. 2. 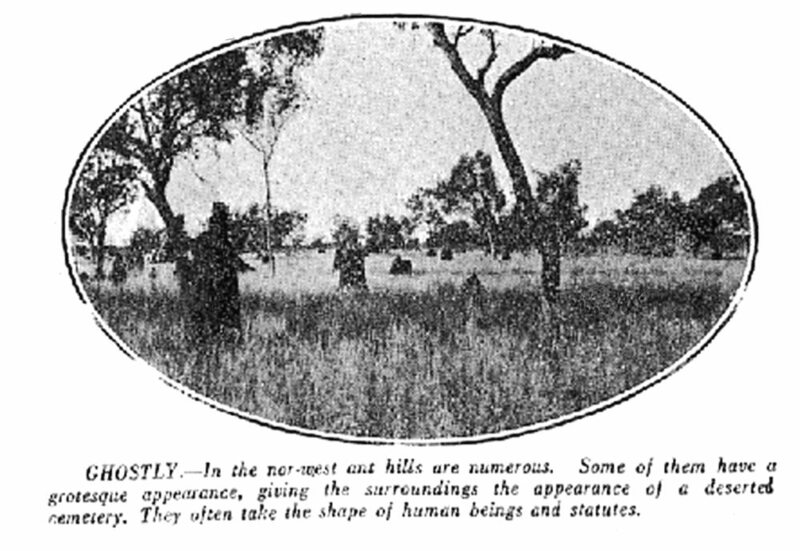 Ghostly: In the nor-west ant hills are numerous. Some of them have a grotesque appearance, giving the surrounds the appearance of a deserted cemetery. They often take the shape of human beings and statutes. 3. Posing: One of the many roadside meetings on the Nullabor Plains. 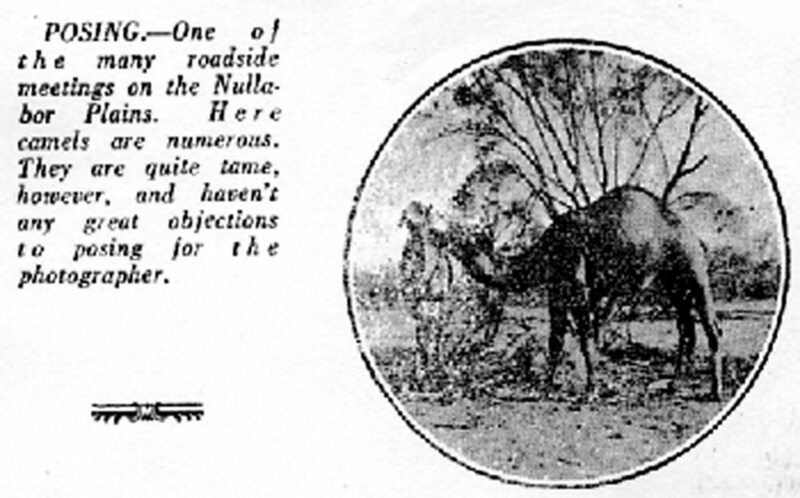 Here camels are numerous. They are quite tame, however, and haven?t any great objections to posing for the photographer. 4. 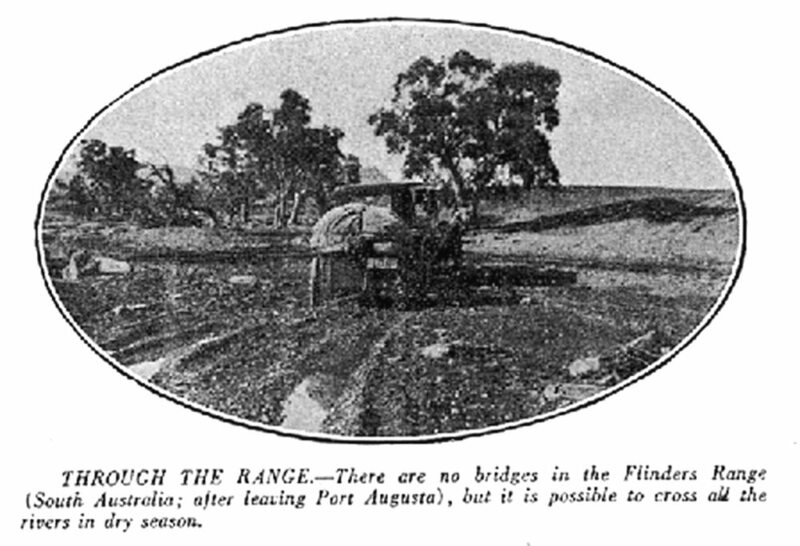 Through the Range: There are no bridges in the Flinders Range (South Australia; after leaving Port Augusta), but it is possible to cross all the rivers in the dry season. 5. Heavy Going: This sort of thing does not appeal to the hurrying city man. But you just have to keep the ?bus moving, and all is well. Otherwise—-! This is how the Nullabor Plains (Port Augusta to Perth) appear in wet weather. 7. Lost: This is Bob, a kelpie much prized by Mr L.J.Barnes, of Dee Why, who jumped on the running board of a car between Kempsey and Sydney, and is now lost. 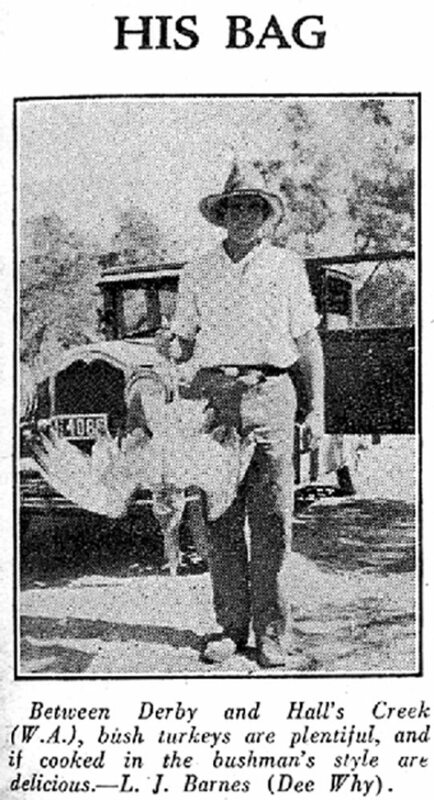 The dog accompanied Mr Barnes on a recent round-Australia tour. Mr Barnes would appreciate some news.